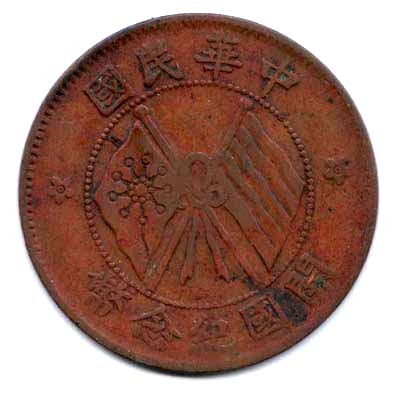 During the later Qing dynasty, the coinage of the ancient copper coins had been suspended in most of the provinces in China. 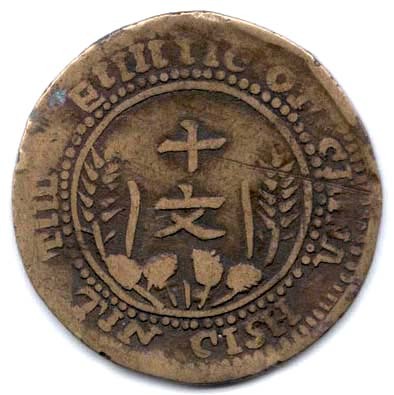 The Mint masters found that they could not cast the tranditional cash coins economically, they stopped casting and engaged in another kind of circular coin struck by machinery without a square hole in the centre. 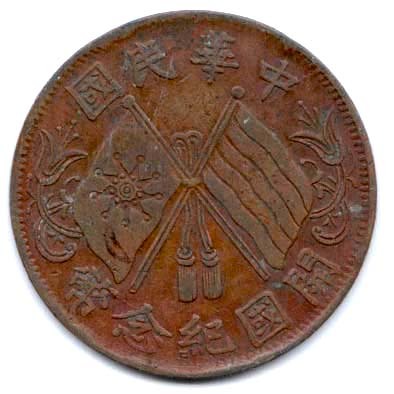 It was known as "T'ung Yuan" [ copper coin], or "T'ung Hsien" [ copper cent] and or "Tung Pan" [ copper plate] Each one is equivalent to ten cash. 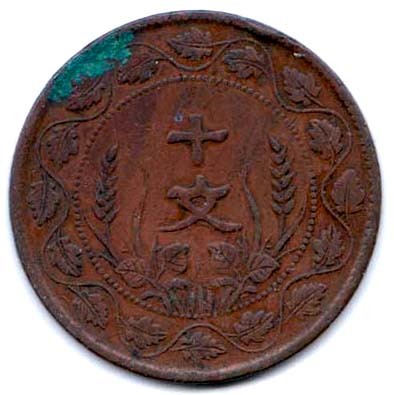 Later, there were also denominations of 1, 2, 5, 20, and 30 cash. 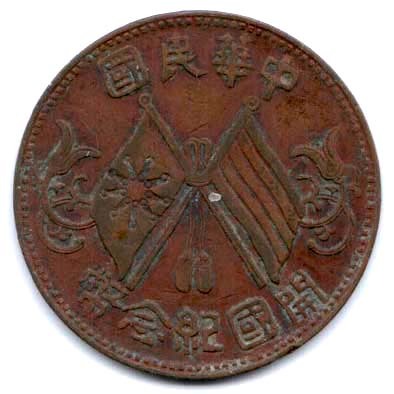 Copper Coin was first minted in Kwangtung province in the 26th years of the "Kwang Hsu" reign (1900AD). 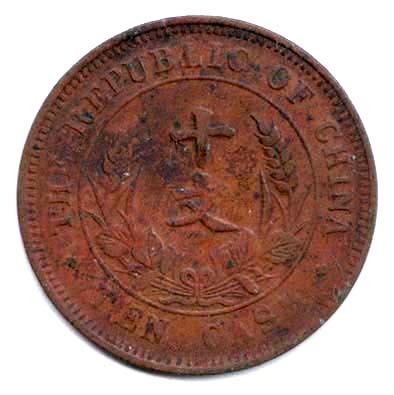 Some sources date these posted below 10 cash pieces bearing crossed flags circa about 1912, but many were not struck until the 1920s. 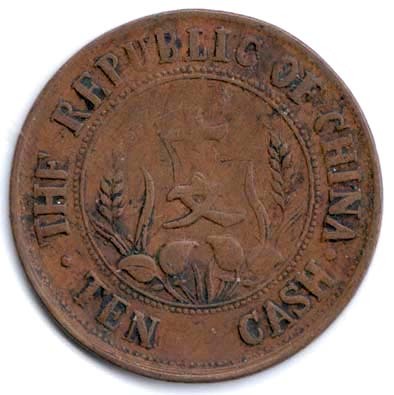 There are more than ten recognized varieties of the Commeemorative 10 cash copper coins. They come in a variety of designs, ranging from simple to intricate. 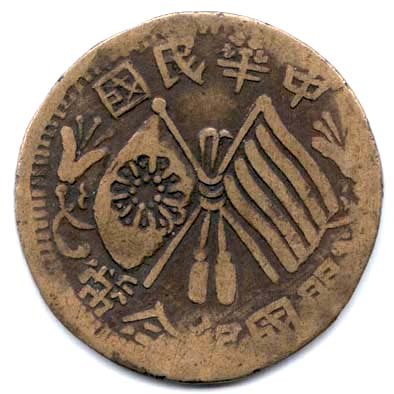 These varieties are usually not identified by even the Chinese collectors for lack of references. 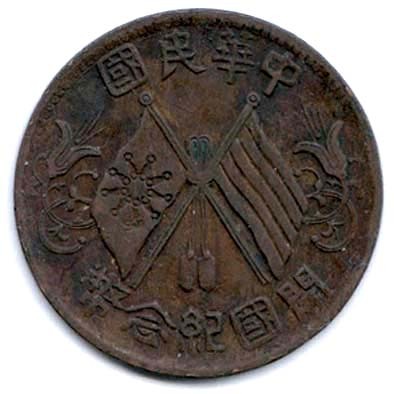 The obverse of this coin is the official design of iron-and-blood 18-star flag and the five-colour flag crossed in center, encircled with the words in Chinese "The Republic of China" and "Incommemoration of Inauguration" and some decorative designs on either side. 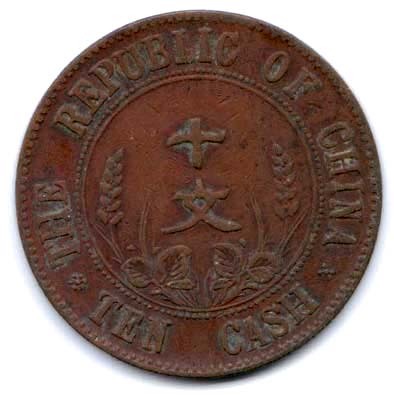 In the centre of the reverse is inscribed the coin's face value and the design of good harvest, with words "THE REPUBLIC OF CHINA, TEN CASH" in English with Chinese translation in its surrounding and some asterisks on either side. 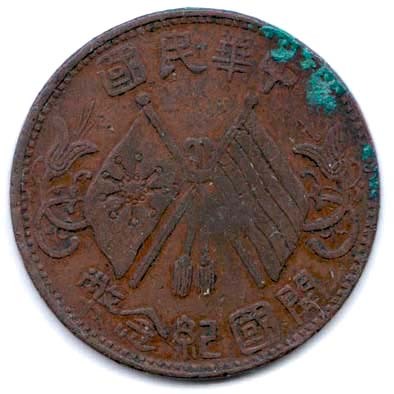 On top of this coin in Chinese, The Republic of China. 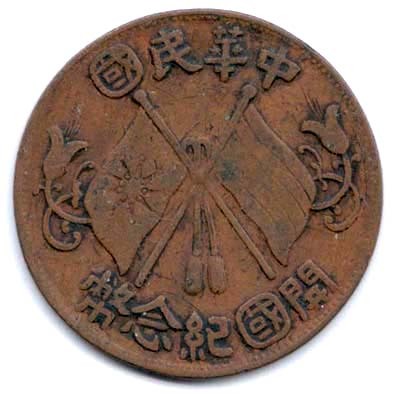 The official design of iron-and-blood 18-star flag and the five-colour flag crossed in center. 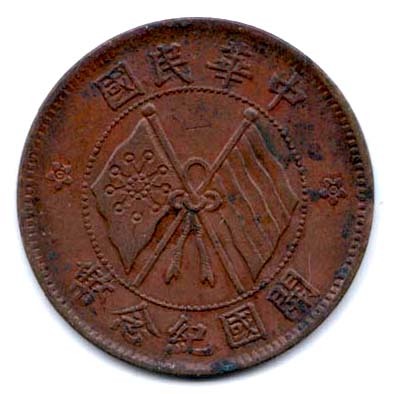 At bottom in Chinese, Coin to commemorate in the Birth of the Republic. 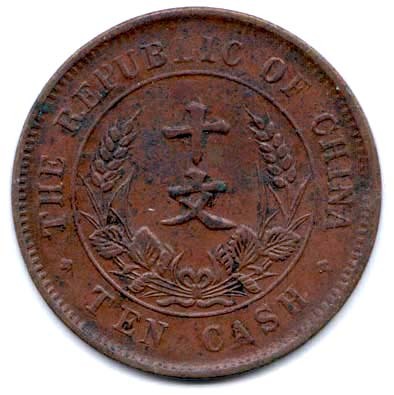 In centre, Chinese characters means 10 cash. 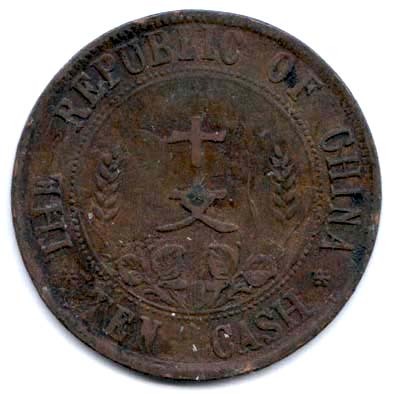 On top is the legend THE REPUBLIC OF CHINA and below 10 Cash in English which are separated by asterisks.